Sources: USEPA (1997) 1996 Clean Water Needs Survey and U.S. Census Bureau Population Projections. Notes: Less than secondary = Primary and ad vanced primary wastewater treatment; Greater than secondary = "Totals only shown for 2025 projections. Advanced secondary and advanced wastewater treatment. Figure 2-17 POTW influent and effluent BODu loading and removal efficiency for select years between 1940 and 1996 and 2016 and 2025. Sources: U.S. Public Health Service Municipal Wastewater Inventories, USEPA Clean Water Needs Surveys, and U.S. Census Bureau Population Projections. • Population growth from 1996 to 2016 will increase influent BODu loading nationwide to 68,030 mt/day, an increase of 45 percent. 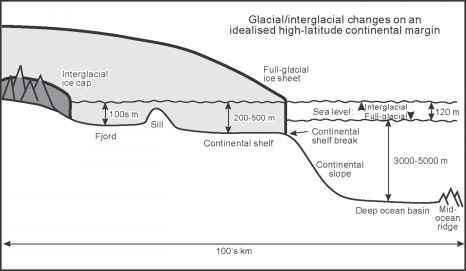 By 2025, influent loading will be about 73,057 mt/day, a 56 percent increase from 1996. • In spite of a projected national increase in BODu removal efficiency from 65 to 71 percent by 2016 (a 9 percent increase), it is estimated that the trend of decreasing effluent BODu loadings experienced in the 24-year period from 1968 to 1996 will be reversed. It is predicted that effluent BODu loadings will increase from 16,325 mt/day in 1996 to 19,606 mt/day in 2016, an increase of 20 percent. The effluent BODu loading rate estimated for 2016 is about equal to effluent loading rates that existed in the mid-1970s, only a few years after the CWA was enacted! • By 2025, the projected effluent BODu loading will be 21,090 mt/day, an increase of 29 percent from 1996. This rate is about equal to effluent loading rates experienced in 1968 (21,280 mt/day), the year when the discharge of oxygen-demanding material from POTWs had reached its historical peak! • By 2016, when the projected needs for wastewater treatment are expected to be met (USEPA, 1997), the overall BODu removal efficiency of 71 percent and increases in population will result in a 20 percent increase of effluent loads relative to the 1996 loading rate. To maintain an effluent BODu loading rate comparable to 1996 conditions through 2016 (i.e., "running in place"), the national aggregate removal efficiency would have to be increased from 71 to 76 percent. This would need to be accomplished by shifting the projected population served from secondary to advanced secondary and advanced wastewater treatment facilities. 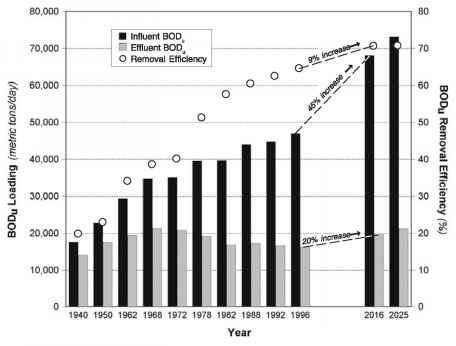 The estimated projections of increasing effluent loading rates of BODu over the next quarter-century underscore the importance of continually investing in improvements to wastewater treatment infrastructure to maintain and improve pollutant removal efficiencies. Without these improvements, many of the environmental successes of the water pollution control efforts over the past three decades may be overwhelmed by the future demand from population growth. The very real risk of losing the environmental gains achieved by federal (Construction Grants Program), state, and local water pollution control efforts under the technology-based and water quality-based effluent limit regulations of the 1972 CWA is also documented by Jobin (1998) and the Water Infrastructure Network (WIN, 2000).